Not much sewing going on this month. But I did get my Designer Block of the Month done. I really love how these blocks are turning out. amylouwho is moving this week but she has a hero stepping to rescue Sew and Tell. traceyjay quilts is auctioning off a beautiful "Garden Stars and Stripes" tablerunner to benefit Operation Family Fund. An organization whose mission (from their website) is to "assist the injured and families of the those who have been injured or killed as a part of the Global War on Terrorism, whether domestic or abroad, military or civilian, with financial grants for transitioning to their new circumstances and achieving financial self-sufficiency". 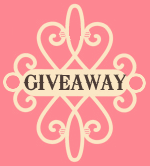 Tracey is also having a giveaway that is sponsored by Burgundy Buttons. You can sign up here. And while we're at it, my friend Pat over at Quilting Can Be Fun! is also hosting a Yard Sale Giveaway. It's really a fun giveaway and Pat always has some great quilting insights. Be sure to stop over and sign up. You can also find a very lovely giveaway over at Jenny of Elefantz! Jenny is an incredible designer from Australia, and always has the most beautiful patterns available. 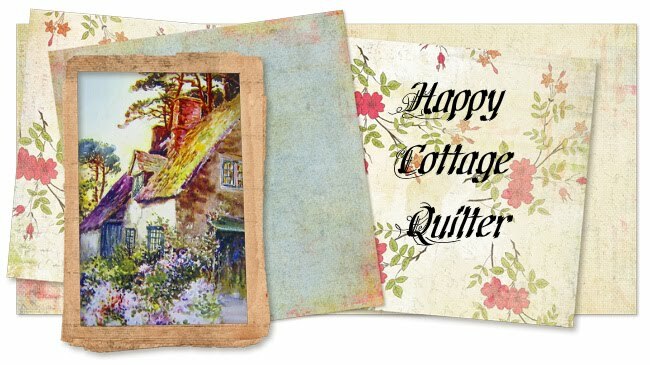 Now if you sign up for Jenny's giveaway, mention that Happy Cottage Quilter sent you! I've always enjoyed getting Frequent Flyer miles ;-) Check it out! AND check out "What's in the Bag" at Stash Manicure! If you are not following this blog, you are missing out on some great stash busting ideas. Most of the string quilts that I have seen are sewn on the diagonal. Last week I thought I would try sewing scrap strings into a block pattern. Over the weekend I finished quilting it. This is how it turned out. It was fun using scraps of fabric for this wall hanging. Do you sometimes remember the other projects you've made with the fabrics? I have been making my way through the Bloggers Quilt Festival. It's a slow process, but WOW what incredible quilts! Be sure to take a tour of all the wonderful quilting blogs. And an update on my SMS giveaway. The winner of my Machine Quilting prize was Nicole C. from Southport NC. Nicole does not have a blog, and is a fairly new quilter. She has two little ones with number three on the way :-) So congratulations to Nicole. Your package is already in the mail. I am joining Tea Rose Home Link party. Stop by and join the party! Today starts the Bloggers Quilt Festival hosted by Amy's Creative Side. A fun way to visit lots of blogs and see some wonderful quilts. This is my third time participating in the Quilt Festival. "Matthew's Quilt" was started back around 1986. I was a new quilter and had taken a quilting class at the local craft store. Back then we were taught how to cut out the pieces with scissors and used cardboard templates. Towards the end of the class, our teacher showed us a tool that looked like a pizza cutter. She told us this was a Rotary Cutter and would speed cutting time. Of course we all laughed and said it could not take the place of scissors! HA! About that same time, my sister in law took a class at a quilt shop. She learned Eleanor Burns Quilt in A Day pattern for the Log Cabin. She quickly shared with me how quick and easy it was to use this method. And as the saying goes, the rest is history. I purchased these 100% cotton fabrics at the quilt shop. My plan was to make a quilt for my then toddler son. We worked on the Log Cabin pattern, and I completed the top. It was my goal to hand quilt this quilt. This is one of my favorite quilts. It was fun to work on, and I love how the colors all worked together. I am very honored to have this quilt listed in the Online Quilt Museum. It is under the Cabin Fever category. Enjoy your walk through the Bloggers Quilt Festival! I am sure we will all be amazed at the incredibly creative and gorgeous quilts that are being shown this time. Well we are closing in on the last few hours of Sew, Mama, Sew's Giveaway Day. And it really makes me stop and wonder HOW do they do it? Not only is SMS very organized and on time, but Amy at Amy's Creative Side is hosting another online Blogger's Quilt Festival starting on Friday. She birthed this idea for a lot of us who are not able or can't go to "market" or the national Quilt shows. Still, it takes time and organizing to make these fabulous projects happen. So I join in with my other blogger friends and send Roses to these gals who take time out of their own busy lives to make these activities happen for us. Thanks to them we can enjoy some fun and exciting quilting/crafting shows and giveaways. If you are here looking for my Sew, Mama, Sew giveaway, please check here. My giveaway ends tomorrow evening. And be sure to stop back by on Friday as I participate in the Bloggers Quilt Festival. You know sometimes your friends make your grovel. I mean who would ask you to show your entire (messy) sewing area and fabric stash. Or make a video of yourself in an unusual position while sewing. HOWEVER, when a GO! Fabric Cutter is at stake, I think we may consider a few options. Well maybe I won't call up some famous person and ask them to make a phone call for me, but then again if I KNEW a famous person I might consider doing it. So Kelly, here is my offering. Please get your pitch pipe out and play to the tune of "A Hunting We Will Go". Hi, Ho a Merry O, with GO! Fabric Cutter GO! for a Hi, Ho a Merry O, with GO! Fabric Cutter GO! with a Hi, Ho a Merry O, with GO! Fabric Cutter GO! and a Hi, Ho a Merry O, thanks for GO! Fabric Cutter GO! Please be sure to stop by I Have A Notion and check out Kelly's giveaway of a GO! Fabric Cutter. She also has the best prices in her shop. If you are stopping by for Sew, Mama, Sew Giveaway Day go here. One year ago I was a fairly new blogger who came upon the blogging scene not thinking anyone would be reading about my little end of the world. Then I came upon the Sew, Mama, Sew blog and the Giveaway Day. I signed up and was introduced to so many new quilting/crafting friends. I've been so amazed at the incredible talent and creativity out there in blog land! Sew, Mama, Sew is having another Spring Giveaway Day, and it only seemed fitting for me to participate once again. If you are new to my blog, WELCOME! I hope you will come again. And thanks to my faithful reader friends who have cheered me along the way. So here is the deal. I am giving away a Machine Quilting package. My hope is that you will enjoy these items and they will help you get a jump start on machine quilting on your home sewing machine. a water soluble marking pencil, and a water soluble marking pen, plus a sliding quilt stencil. the Quilt in a Day Machine Quilting Primer DVD starring none other then Eleanor Burns. I'm also including a Clover Non Slip Stick which helps for surface control of fabric while machine quilting. So there is my little offering for Sew, Mama, Sew's Giveaway Day. Please leave a comment on this post to be entered. I love reading comments, so let me know who you are and where you are located. It is so interesting to see how far and wide this Giveaway Day will go. The drawing will be open until Thursday May 20th. I am open to including one and all. PLEASE be sure that I have a way to contact you. If the winner has a no-reply email, another name will be drawn. oooo.........isn't this exciting? I can't wait to visit all of you who are participating. And I can't wait to meet new friends. .........I just had to do some sewing today. I've seen the string quilts all done diagonally. So I thought I would just try blocks. Don't know where this is going, but I had to have a little fabric fix. There is a lot of excitement going on this month in blogland. Contests, giveaways, and festivals!! Sew, Mama, Sew! is hosting their May Giveaway Day starting on Monday May 17th. If you have never visited before, mark your calendar. This is a great way to meet new (and old) crafting/quilting friends! If you would like to participate, go here to find out the details. You have until Sunday to sign up. If you just want to visit, then check back on Monday and take a wonderful ride on the SMS site. And tell me you did have a wonderful time at the Blogger's Quilt Festival last year! Amy is doing it again! If you love quilts you'll want to check out all the quilts that will be shared at Amy's Creative Side during the Spring Blogger's Quilt Festival, May 21-28, 2010. If you want to join in the fun and enter a quilt, click here. Amy has done such a wonderful job at organizing this event. She's got great sponsors and it is easy to visit everyone on Mr Linky. You won't want to miss this one! Oh my, what fun days are ahead. As I sit here at the computer this morning, I am enjoying the sweet fragrance of flowers. My sweet children gave me the most beautiful flowers for Mother's Day. And the incense of their fragrance is heavenly. My sweet daughter bought all of these flowers and made this arrangement for me. And my son sent these flowers through the MAIL!!! Well actually Fedex delivered them on Saturday, but I could not believe these beautiful flowers! They were delivered in a box, with the vase and all! Amazing. And thank you all so much for the advice on my cross stitch. I really did not want to toss it. I am going to dig out the pattern and see if I can fix it. I do appreciate everyone's comments and suggestions. Much food for thought. A very long time ago, I used to do a lot of cross stitch. I enjoyed making little pictures and smaller projects. Then I took on the task of making a sampler. I loved this pattern, and worked on it diligently. But then something happened. Somewhere along the line, I made a mistake. And the border was not going to come together. I was so disappointed and after several attempts to try to correct it, I left the sampler alone. And so it has been sitting in my cedar chest. 1. Try to fix the problem? 2. Cut the sampler and frame it or make a pillow. or 3. Just toss it?? I'd love to hear some thoughts. the other dainty and fair. with prayers and hugs caress. she prays from her rocking chair. What's a quilter to do?? Do you know what a quilter does when she has several hours on her hands waiting for their son to take a tour of a college in our area. Why she goes to a quilt shop of course! When you are within radar range, what better way to spend an hour (or two?) then to check out what's new? I thought this pattern was very nicely done. Love the Tea theme. And YES I had to find some delicious fabrics to bring home. I'm hoping these will make a good start for the Six Degrees pattern in Miss Rosie's book. And today there was this sweet little package in my mail. Kim from bitty bits & pieces sent this to me. Isn't it adorable? And look at her card. She lists herself as a Quilter, Teacher and BLOGGER! Yeh buddy! Way to go Kim! And thanks so much for the sweet little crocheted pin. I am always so amazed at the incredible talent that is shared in blog land. Wishing you a marvelously happy quilty day! Prayer is the door that opens a heavenly connection into an unseen realm. There is so much excitement in the air. EQ7 is on its way. And my friend Kelly at I Have a Notion is having a pre-order sale. Please stop by her blog and take a look. If you ever wanted to try this program, now is the time to try it. Well what can I say. I love quilt books. They inspire me. It's fun to look at the different quilt books by different authors. There are books that I want, and some that I just have to have. So when a quilting book comes along, one that I have been wanting, but just have never gotten around to obtaining, you just jump at the opportunity. Right? RIGHT?? So I am at JoAnn's the other day. And of course I need to take a look at the quilting books. There just might be something new to look at. So I spy these little red tags on some of the displays. Red tags, like clearance SALE tags. Of course all of the books that are labeled to be clearance are already gone. So I do a search. See this is where my thrifting skills come into play. I start down the rows. Nothing. Keep looking. Still nothing. But wait! On the very bottom row, behind another title................ whoa................. Miss Rosie is peeking out at me. You know who Miss Rosie is, right?? I'm just asking because I've asked at a couple of quilt shops lately and they look at me like I am from another planet. Yes, Carrie's Miss Rosie. And it has a red tag!! YES!!! I am a Schnibbleholic, and ever since I've been making the little Schnibbles quilts I've been eyeing this quilt book. Look at this one. Six Degrees.......... sigh................ So pretty. Well this is not the end of the clearance story. Because as I am searching through the racks, I find this one. And oops, one more, hiding again behind another book.